My journey in the field of wildlife conservation began in 2009 during my Masters research project with the Lowveld Wild Dog Project (LWDP) in South-East Lowveld, Zimbabwe. My study looked at the diet and overlap in diet of four large carnivores (African wild dog, Lion, Hyena and Leopard) and the implications for the conservation of the African wild dog. I joined WildCRU in 2012 as a postgraduate diploma student. This opportunity equipped me with important theoretical and practical skills that are proving essential as I continue moving forward in the field of wildlife conservation. Upon completion of the Diploma, I joined the Hwange Lion Project as an intern from January to August 2013. It was during this time in Hwange that I developed ideas for my DPhil thesis, I then returned to Oxford in October 2013 to start my DPhil. The focus of my doctoral thesis is to assess the effect of resource abundance and distribution, on the ecology and social behaviour of social animals using the example of a social large carnivore, the African lion. 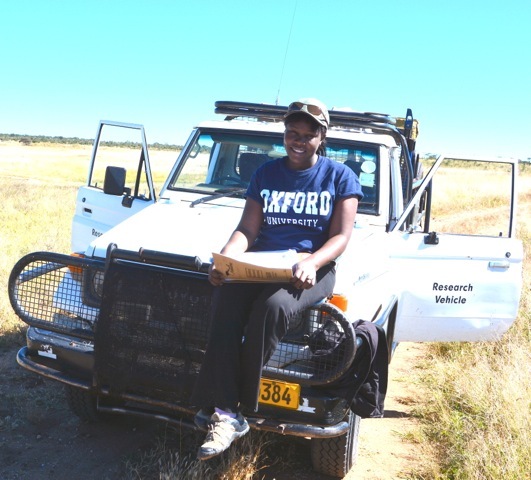 I am carrying out my study in Hwange National Park, which is a semi-arid landscape where resources are heterogeneously distributed in both space, and time and this permits us to perform natural experiments on the effects of resource distributions. As the apex predator in African savannah ecosystems, understanding how the abundance and dispersion of resources influences lion ecology and social behaviour is important for management and conservation actions.